Travelling is one of lives most stressful challenges. Remembering to pack everything, trying to squeeze it all in to your case and making sure you don’t go over your allocated luggage allowance all add to the stresses of packing for a trip away. Once you’ve tackled all this, the last thing you want to find is that your luggage has been broken into and your personal belongings stolen or for the wheels to break as you’re wheeling your case to airport check-in. Here we’ve collated a list of all the things you should be looking for when you’re next shopping for luggage. Suitcases typically come in a soft or hard shell. As with anything, there are pros and cons to both and careful consideration is required before purchasing your preferred type. Hard suitcases are strong and lightweight. The benefit of this is that they offer maximum protection and don’t eat too much into your baggage allowance. Hard cases are notoriously difficult to break into as they can’t be easily sliced open with a sharp implement, meaning their security is higher than that of a soft case. The hard shell of the casing gives belongings optimum protection due to it being more durable, therefore fragile items are less likely to be damaged in transit. One of the major disadvantages of a hard suitcase is its size when opened up. Hard suitcases are only accessible by fully opening the case and laying it flat, meaning packing and unpacking in a cramped hotel room can prove difficult. Their size even when closed can be a drawback too, especially when storing and packing them in a car alongside other people’s luggage. If you’re looking for organisation when packing then a soft case may be ideal. Soft cases usually have multiple internal and external pockets, so small, additional items can easily be accessed at any time. The softness of these suitcases also makes them easier to store and load into vehicles. Soft suitcases tend to be versatile and can be expanded quickly and easily by unzipping an additional section to enlarge the size of the case, which can be closed again when not required. The drawbacks of a soft case include security concerns. The fabric they are made from can easily be cut open and items stolen. Items stored within these cases also have less protection due to the flimsier nature of the fabric they are made from. Therefore, it’s not recommended that fragile items, such as glasses are stored inside them. The lighter fabric of the case is also likely to sustain considerable wear and tear with each use which could hinder the longevity of the case. Hard suitcases are often made out of polypropylene. The benefits of this material is that it’s light and responds well to impact such as knocks and bumps sustained during transport. Acrylonitrile-butadiene-styrene (ABS) is also frequently used in the manufacturing of hard suitcases. ABS is a strong material, however it isn’t as tough as polypropylene. A third common material used is polycarbonate (PC). Polycarbonate provides strong, rigid, durable and lightweight cases, although a downside is that it’s easily scratched, so the overall look and appearance of your case is affected. Soft suitcases are typically made from either nylon or polyester. Nylon is tough and resistant, therefore suitcases made from it are durable and provide a good level of protection. Polyester is a relatively cheap product and you’ll find polyester suitcases much more affordable than nylon made ones. Polyester is somewhat durable, however it rips and tears easier than other materials. Luggage that comes with wheels allows you to easily take your belongings from the car to the airport and to the hotel without the need to carry it around, risking injury. Luggage typically comes with two or four wheels and the best option for you depends on the circumstances in which you will be using your piece of luggage. Four wheeled pieces of luggage spin 360 degrees, meaning you can easily wheel around with you and around any obstacles or in tight spaces. A disadvantage, however, is that a four wheeled piece of luggage can easily roll away when at a slight angle. Suitcases with two wheels only go backwards and forwards, therefore if you have lots of objects to manoeuvre around, they’re not practical. However, if you plan to roll it along streets, paths and other bumpy surfaces than a two-wheeler may be the perfect option for you. Wheels tender to be one of the weakest points of a suitcase. A broken wheel mid-trip is far from ideal and therefore you should check the quality and durability of them before purchasing your piece of luggage. Wheels should roll smoothly and be firmly attached to the suitcase. 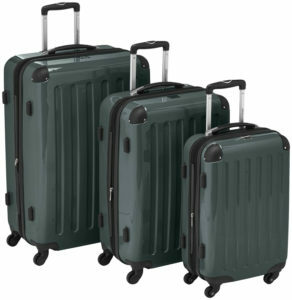 Four-wheeled suitcases are typically attached to the suitcase externally, making them weaker than internal mounted wheels. Wheels attached with screws are much sturdier than rivet attached wheels. 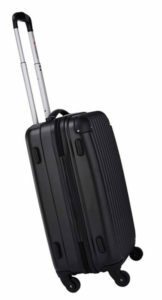 The wheels on a two-wheeled suitcase are usually found recessed onto the case. Therefore the likelihood of them breaking is significantly reduced. This and the fact that the wheels only roll back and forth make them a more durable option. Selecting the size of your case can be a tricky decision to make. You want to ensure that you’re able to fit all your belongings in it plus any extras you buy on your travels, but at the same time don’t want to be stuck with a case that you can’t manoeuvre around. Luggage comes in an abundance of sizes. Typically, they vary between 20 and 30 inches, but larger cases are available. Which size case you use should depend on where you’re travelling to, how long you’ll be away for and how much stuff you need to take away with you. A couple’s weekend away in Paris would usually require less luggage than a family a four’s fortnight in Spain, for example. Luggage handles come in many different forms. Options include short handles so that you can easily pick the bag up and long, retractable handles which allow you pull or drag your suitcase around. Straps can be made from a variety of materials, including vinyl, leather, aluminium and other metals. Straps made of metal can be attached by either screws or rivets. Screws tend to be stronger, so it’s best to check for this when buying metal-handled luggage. Handles made of cloth can be weak, especially when the luggage is packed full of items. These types of handles should be attached with reinforced stitching to prevent them from falling apart. Compartments and pockets on luggage can be extremely handy. Depending on the type of luggage you may find compartments and pockets on the interior or exterior or on both. Interior pockets are a great way of organising and separating belongings whilst keeping them neatly packed away. Toiletries, medicines and books are great items to pack in interior pockets. Exterior pockets can be really handy when hanging around places such as airports as they allow you to quickly pop items in and out of the pockets. Many travellers store their boarding passes in these pockets, as well as snacks and a bottle of water. Zips tend to be a weak point on luggage. Two types of zippers tend to be used on luggage: coil or chain. Coil zippers run smoothly when used and are particularly flexible. They are also good as they can easily be pulled back into place if they become misaligned. Chain zippers are, however, more durable than coil ones and, where possible, a chain-zipped piece of luggage should be selected. The individual interlocking teeth make chain zippers more durable and more secure. These benefits do however make them more expensive and they are sparsely used on mass-produced luggage. Luggage that comes with a manufacturer’s warranty is a great choice and something to keep a look out for. Warranties typically cover a set period of time such as 5 or 10 years, however it is possible to find luggage covered by a lifetime warranty. Luggage covered by a warranty may be more expensive, but you’re also safe in the knowledge that you’ll never have to purchase another piece of luggage again. Keeping your luggage secure is often one of a traveller’s top priorities. Arriving at your destination, picking up your case and finding your personal items have been stolen would be a horrendous experience for anyone to go through. There are a number of accessories you can purchase to add to your pieces of packed luggage to keep thieves at bay. Some pieces of luggage even come with some security features and you’ll occasionally find a case with TSA security padlock included with it. TSA security padlocks are one of the most frequently used pieces of security on baggage. Airport security is able to open these if they’re required to inspect your bags, but it means they won’t cause any damage to your case. Another option is to use a luggage strap. 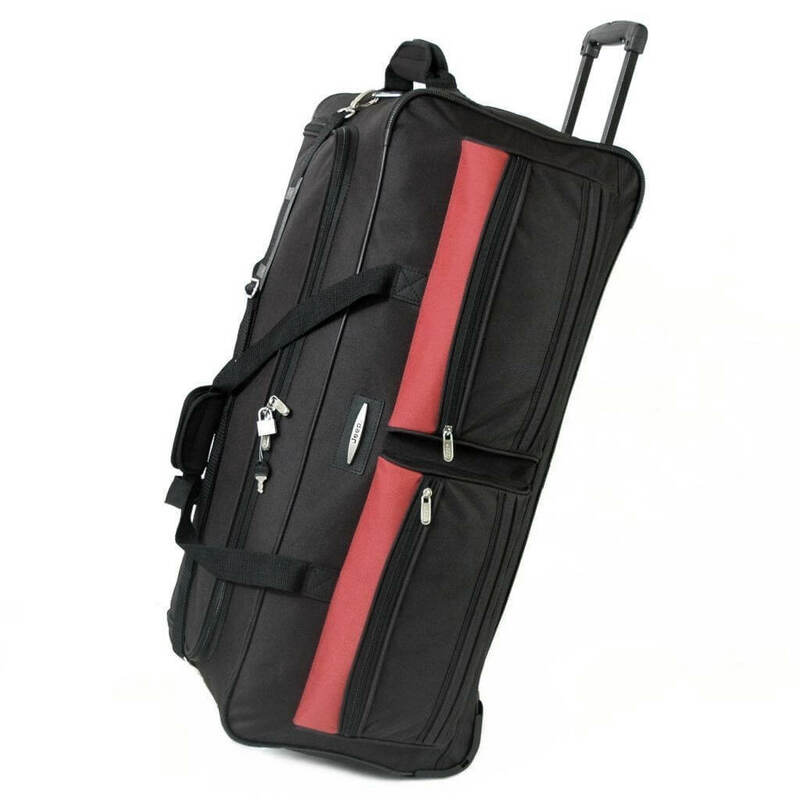 Luggage straps wrap around your case when closed, keeping everything in place. This ensures that it doesn’t fall open during travel. There are multiple factors to take into consideration when selecting luggage. A high quality, durable piece of luggage can last for many years if you take time and care in reviewing and choosing your chosen piece. The market is awash with luggage options and it can all seem a little overwhelming when you first look, but by following our advice you can be sure you pick the perfect piece for you and your needs.